This is it, Marvel fans. The film we have been waiting for. The one that unites our heroes from the past ten years of cinematic heroics to combat a threat they have never faced. Enter the turning point in the Marvel Cinematic Universe: enter the Infinity War. This is a spoiler-filled review, if you haven’t seen this film yet, stop reading now! From Anthony and Joe Russo, we get a film that has so much hype behind it, it’s steamrolling the box office as I type this. The film kicks off not long after the end of Thor: Ragnarok. The vessel carrying all of the remaining Asgardians has been attacked by the Mad Titan Thanos (Josh Brolin) and his Black Order. We see Thor and Loki laid to waste, unable to stop Thanos. Heck, not even the Hulk (Mark Ruffalo) stood a chance against Thanos in a one on one fight. The beginning of this film reminds me a lot of the beginning of the original, animated Transformers: The Movie. We see the deaths of two fan-favorite characters in a matter of minutes, letting us know that no one is safe. This is all for the Tesseract, one of the Infinity Stones Thanos needs to gain the power he needs to wipe half the population off the universal grid. This film, first and foremost, is a Thanos film. His heart is ultimately in the right place: he is trying to save the universe from ending up the way his planet of Titan did when they ignored his ideas. It’s his logic and methods that are flawed. This is a departure from Thanos’s comic book motives, that being his is in love with Death and that sends him on a rampage through the cosmos. Brolin steals the show, hands down, and Thanos becomes the best villain in the Marvel Cinematic Universe right now, just edging out Black Panther’s Erik Killmonger. But what about the heroes? Oh, they are all here… well, almost all here. Besides the noticeable no-shows of Hawkeye and Ant-Man, everyone else you can think of from the Marvel Universe makes an appearance. From the aforementioned Hulk being shot down to Earth, to Iron Man (Robert Downey Jr), Spider-Man (Tom Holland), Doctor Strange (Benedict Cumberbatch) and the Guardians of the Galaxy taking a stand against Thanos on his homeworld, we get to see a lot of our favorite characters. Thor (Chris Hemsworth) goes on a mission to get a weapon that could kill Thanos, accompanied by Rocket (Bradley Cooper) and teen Groot (Vin Diesel). Captain America (Chris Evans) joins forces with the newly christened White Wolf (Sebastian Shaw), Falcon (Anthony Mackie), Black Panther (Chadwick Boseman) and the nation of Wakanda to battle Thanos’s Black Order as they invade Earth in search of the last Infinity Stone, tucked safely away in Vision’s head. The interactions between these characters are so great, it was well worth the wait. Out of our returning heroes, I felt Iron Man and Spider-Man really shined here, as did Doctor Strange. Strange may end up being the key to defeating Thanos in the next film, as he saw all the different scenarios that could happen as they fight Thanos. But the Avenger here that outshined the rest has to be Chris Hemsworth’s Thor. From the brink of defeat to almost ending the life of the Mad Titan once and for all (should have gone for the head), the God of Thunder shows he is one of, if not the, mightiest Avenger. There is a lot to take in with this long film. It takes multiple showings to grasp everything going on. But as the end of the film drew near, we hit my biggest gripe of the film. The disappearing deaths of half the Avengers and most of the Guardians of the Galaxy. I don’t mind the deaths, it’s the fact that with names like Spider-Man and Black Panther thrown into it, we all know for a fact that Marvel is not killing of two of the biggest and newest heroes. It made the deaths feel cheap, as we know there is a way to bring them back. I do believe that Loki (Tom Hiddleston), Heimdall (Idris Elba), and Gamora (Zoe Saldana) will stay dead, but the disappearing deaths? Not a chance. That doesn’t take away the amazing ending, with Thanos smiling at his handiwork and taking a minute to rest. I cannot wait for the second part of this film, and I have more than one theory on how our heroes not only stop Thanos but return the heroes that died at the end as well. 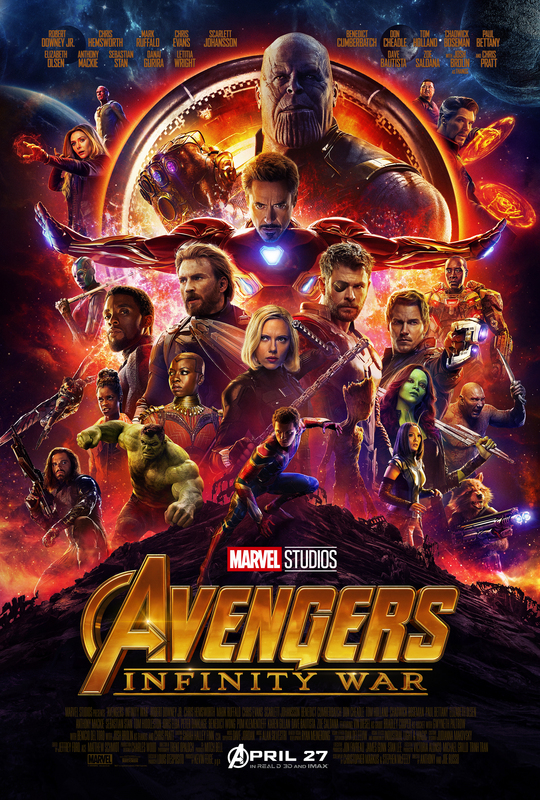 Avengers: Infinity War is the best of the Avenger films, easily, and is in the top 5 of Marvel films for me. I need to watch it a few more times before I can place it above Captain America: The Winter Soldier and Black Panther. But it is the big, epic crossover we all hoped for, and it sets the stage for the next phase in the Marvel Cinematic Universe.